Located in Centro, the Hotel Presidente Granada offers affordable air-conditioned rooms with en suite bathrooms. The Hotel Presidente Granada has 24 hour room service, a 24 hour reception and family/oversized rooms. Also available on site are multilingual staff, a ticket service and luggage storage. Guests can stay connected with the hotel's standard wireless internet connection. The Hotel Presidente Granada offers comfortable and stylish rooms equipped with a TV, heating and complimentary toiletries. A telephone, a desk with an electrical outlet and a bathtub can be found in each room of the hotel. Guests of the Hotel Presidente Granada can enjoy a continental breakfast, which is served daily. 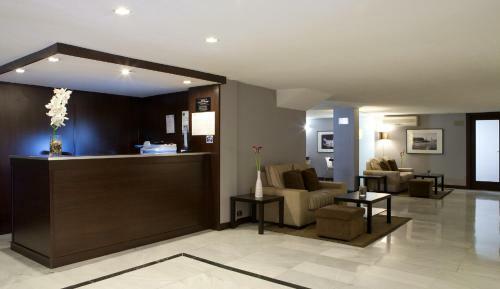 The hotel is a short walk from the Plaza Bib-Rambla, and an easy drive from Monachil. Located within a 10 minute walk from the hotel are the Madrasah of Granada, Royal Chapel of Granada and Granada Cathedral. This hotel is 1568 metres from the Alhambra entrance, 697 metres from Plaza Nueva (the absolute centre of Granada), 1591 metres from the train station and 3219 metres from the bus station.